In this "energetic" (Kirkus Reviews) re-creation of Anne Boleyn's tragic life -- and death -- Robin Maxwell offers a pitch-perfect version of a bawdy and exuberant time filled with lust, betrayal, love, and murder. 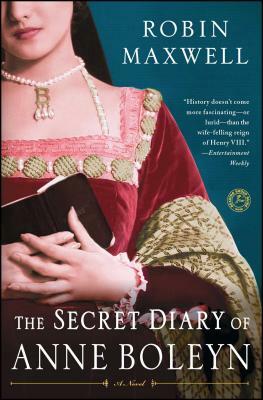 When the young Queen Elizabeth I is entrusted with Anne Boleyn's secret diary, she discovers a great deal about the much-maligned mother she never knew. And on learning the truth about her lascivious and despotic father, Henry VIII, she vows never to relinquish control to any man. But this avowal doesn't prevent Elizabeth from pursuing a torrid love affair with her horsemaster, Robin Dudley -- described with near-shocking candor -- as too are Anne's graphic trysts with a very persistent and lustful Henry. Blending a historian's attention to accuracy with a novelist's artful rendering, Maxwell weaves compelling descriptions of court life and devastating portraits of actual people into her naughty, page-turning tale. The result is a masterpiece of historical fiction -- so prophetic of our time that one would think it were ripped from today's headlines. Robon Maxwell, a devout student of Tudor England, devoted twelve years to the research and writing of The Secret Diary of Anne Boleyn. She lives in Topanga, California, where she is currently at work on a sequel.